Threshold, or detectability, refers to the theoretical minimum concentration of odorant stimulus necessary for perception in a specified percentage of the population, usually the mean. A threshold value is not a fixed physiological fact or a physical constant but is a statistical point representing the best estimate from a group of individual scores. Two types of thresholds can be evaluated: detection and recognition. 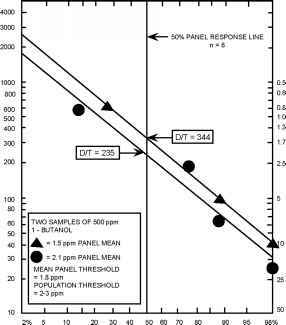 The detection threshold is the lowest concentration of odorant that elicits a sensory response in the olfactory receptors of a specified percentage, usually 50%, of the population being tested (see Figure 5.26.1). The detection threshold is the awareness of an odor without necessarily recognizing it. The recognition threshold is the minimum concentration recognized as having a characteristic odor quality by a specified percentage of the population, usually 50%. It differs from the detection threshold because it is the point at which people can describe a specific odor character to the sensory response.